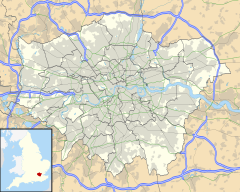 Hainault (/ˈheɪnɔːt/) is a large suburban housing estate in Barkingside in North East London in the London Borough of Redbridge. It is located 12.5 miles (20.1 km) northeast of Charing Cross. 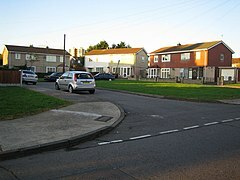 Most of the housing in Hainault was built by the London County Council between 1947 and 1953. Originally spanning the parishes of Chigwell, Dagenham and Ilford, in 1965 the area was combined in a single London borough and became part of Greater London. It is adjacent to the Metropolitan Green Belt, bordered on the east by Hainault Forest Country Park and to the north by open land and the boundary with the Epping Forest District of Essex. For postal addresses, it is split between the Chigwell and Ilford post towns and it is within the London 020 telephone area code. The area is served by London Underground's Central Line. The name Hainault was recorded as 'Henehout' in 1221 and 'Hyneholt' in 1239. It is Old English and means 'wood belonging to a religious community', referring to the ownership of Hainault Forest, part of the larger Epping Forest, by Barking Abbey. The spelling was altered from the 17th century because of a false connection to Philippa of Hainault, the wife of Edward III. The area was mainly forested, it was owned by Barking Abbey and formed part of the Royal Forest of Essex. The large density of forest meant the area was predominately used for the provision of timber for building ships and houses. A decline in demand for timber, and a greater demand for food, led in 1851 to an Act of Parliament authorising the deforestation of much of Hainault Forest. Within six weeks 3,000 acres of woodland was cleared. Urban development began after August 1856, when the Great Eastern Railway built a line between Stratford and Loughton. In 1903, from the line at Woodford Junction, a loop line to Ilford was opened. Hainault was one of the stations on that line. Although it had been hoped that housing development would follow from the building of the railway, it took several decades. Hainault station was closed from 1908, five years after opening; development began in the late 1920s, and the station was reopened in 1930. As a result of the London Passenger Transport Board New Works Programme 1935–40 (not completed until 1948) the line was taken over from the LNER and converted for use by London Underground trains. Because of the lack of available land in the County of London, the London County Council (LCC) was permitted to build housing and act as landlord outside of its territory. It purchased land in Chigwell, Dagenham, and Ilford in 1943. Building of the Hainault Estate commenced after the Second World War from 1947 to 1953. The development of 2,779 houses was in the style known as a 'cottage estate' with the names of the roads relating to the history of Hainault Forest. After the development of the Hainault Estate, the area was within three local government districts. Most of Hainault was split between the Chigwell Urban District and the Municipal Borough of Ilford, with a small part to the east within the Municipal Borough of Dagenham. The population of the Chigwell part of the estate was 7,071 in 1961. The whole area formed part of the review area of the Royal Commission on Local Government in Greater London. It was recommended by the commission that the three districts should become part of Greater London. During the passage of the London Government Act 1963 Chigwell became excluded from the new administrative area, which would have led to the estate being split by a county boundary. Instead, the opportunity was taken to unite the estate in a single London Borough of Redbridge, by combining the 81 acres (0.3 km2) of the estate in Chigwell with the northern section of Dagenham and the whole of the boroughs of Ilford and Wanstead and Woodford. Three councillors are elected to represent the Hainault ward on Redbridge London Borough Council. For postal addresses, it is split between the Chigwell and Ilford post towns in the IG postcode area. It is within the London 020 telephone area code, with the Hainault telephone exchange located just outside the Greater London boundary in Grange Hill. Nearest places are Goodmayes Chigwell, Collier Row, Barkingside and Chadwell Heath. Hainault Athletic Football Club play in the Essex Sunday Combination League and have two teams of players. ^ "Redbridge Ward population 2011". Neighbourhood Statistics. Office for National Statistics. Retrieved 18 October 2016. ^ Cherry, Bridget (2005). London: East. New Haven, CT London: Yale University Press. ISBN 0300107013.